The following routine is a very advanced version of a simple trick that many laymen performed when they were children. Often when laymen want to show you a trick, they either perform the "Twenty-one Card Trick" or this one. 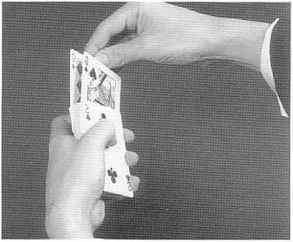 The simple "School Boy Trick" is usually performed as follows: the performer catches a glimpse of and remembers the bottom card of the deck. Let's say that the card is the Five of Spades. The deck is now ribbon spread face down across the table. The layman says, "I will take out the Five of Spades!" He names the bottom card of the deck He now pulls out any card from the spread. He glimpses the card without showing it to anyone else. Let's say the card is the Four of Clubs. After glimpsing the card he sets it face down on the table in front of himself. He now says, "Next I will find the Four of Clubs!" 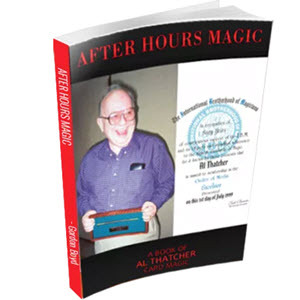 He names the card on the table that he just glimpsed. The layman now pulls another random card out from the spread. He glimpses this card and puts it face down on the table on top of the first card. Let's say that this card is the Ace of Hearts. The layman now says: "I will find one more card, this time the Ace of Hearts!" He now pulls out the bottom card of the deck, peeks at it, to conform with the previous card handling, and places it face down on top of the two other cards. He names the three cards once again: "The Five of Spades, the Four of Clubs and the Ace of Hearts!" The layman now picks up the three cards and tosses them face up on the table, so they separate. This is the old one ahead principle in its simplest form. Now try it this way. Riffle Shuffle the deck once, letting the last two cards on the left side fall last on top. Glimpse and remember them as they fall. Remember the top card first and the second card from the top, second. Nowr give the deck a false cut to dispel any notion that you may have glimpsed a card. The false cut 1 usually perform at this point is S. W. Erdnase's First Fancy Blind Cut on pp. 44 and 45 of "Expert at the Card Table." But any convincing false cut will do. Now pick up the deck, turning it face up in your left hand, and say, "Let's bury a couple of the bottom cards!" Take off the two face cards from the deck with your right hand, and spread the cards between your right thumb and fingers. Insert them face up into two widely separated sections of the face up deck. (See Photos 1 and 2) Now turn the pack face down and say: "Let \s bury a couple of the top cards!" Hold the cards from above with the right hand and turn the pack a little to the left. Bring it to the left side of the table top. Move the right first finger just around the outer corner to the side of the pack as you spread the cards in an arc, from left to right, across the table. The two cards originally glimpsed will be jogged in the spread. (See p Photo 6-Arrows added for clarity) This h "Spread Location" is an idea of Dai 0 Vernon's, and can be found, with an ^ application for one card, in his book "Ultimate Card Secrets," on pp. 129. 4 130 and 131. You now say, "Let's see if I can find the Ten of Hearts!" 1 you are going to make later. .5 Leave the card face down below the spread for the time being. Now vou sav: "Now let's see if I can find the Ace of Clubs!" Pull the Ace of Clubs from the spread towards you. This is the jogged card closest to the top of the spread. Use the same covering action to look at the Ace of Clubs. Name both cards again and slowly turn the two cards face up to show that you are correct. Sweep all the cards together and square the pack. Tap the edge of the pack on the table to square it, glimps-r ing the new top card. 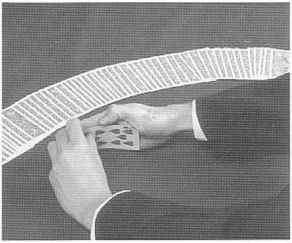 (See Photo S) h An alternative method would be to glimpse the top card during a riffle o shuffle as you did at the beginning of the effect. 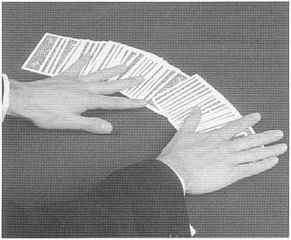 In either method, after you have gained knowledge of the top card, perform a couple of false shuffles and cuts to dispel suspicion. Let's say that the top card is the Six of Spades. Ribbon spread the pack p from left to right across the table. 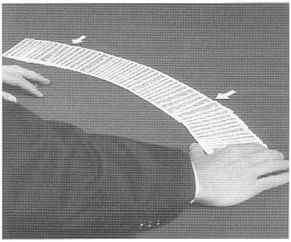 You h will now perform Mario's "Ribbon ° Spread Palm" from "TheTabled Palm" pp. I 1 and 12. 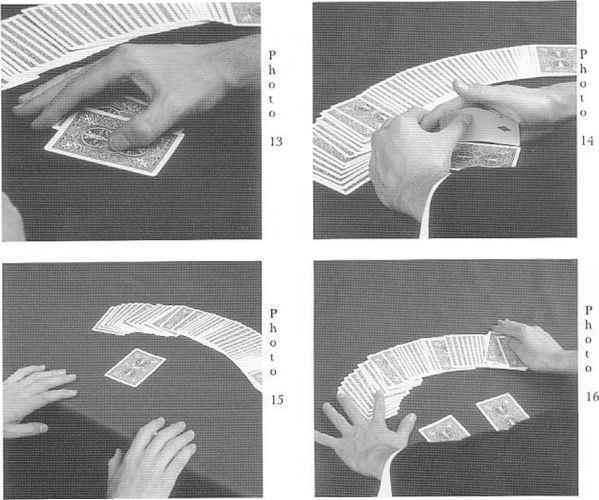 Place your hands on the spread of cards to adjust them as in 7 Photo 9. 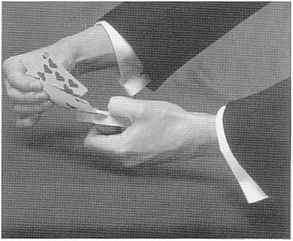 Move your right hand to the right end of the spread and cover the top card. Your right little finger contacts the top card at the upper right corner. 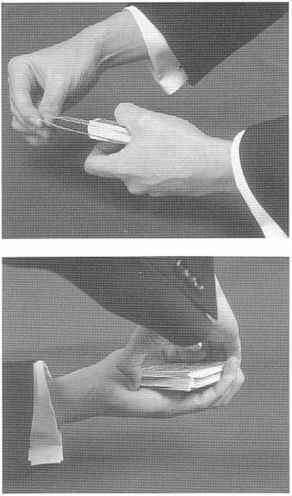 Draw both of your hands back to the edge of the table, sliding the top card (in this case the Six of Spades) along under your right palm. Slide die Six of Spades under the "X" card and line them up with your right thumb and forefinger. 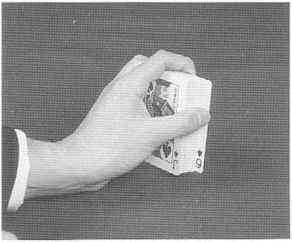 (See Photos 13 and 14) With your right thumb, lift the upper "X" card into your right palm to take the place of the Six of Spades. Glimpse and remember this new card. Let's say it is the Two of Diamonds. Leave the switched in Six on the table in front of you and move both hands to the table edge in rest position. 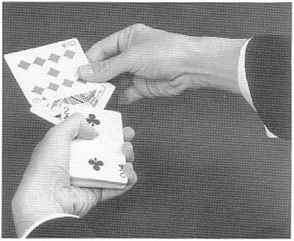 (See Photo 15) Now ask the spectator to push out the "Two of Diamonds," or whatever card is now in your right palm. He pushes any card toward you. Repeat the names of the two selec-tions--"Six of Spades" and "Two of Diamonds." Slowly turn the two cards over to show that they are correct! The next two items I usually reserve for entertaining children. The first one is a stand-up effect and the second one is performed while seated at a table. Both effects, of course, can be performed for adults, but I have so many routines for adults already. I reserve these for children.